We know kitchens are some of our most "lived in" spaces. They are where the party always ends up and where we spend a lot of our family time. But when you have to send text messages from the table to talk to someone by the refrigerator - you've gone too far. 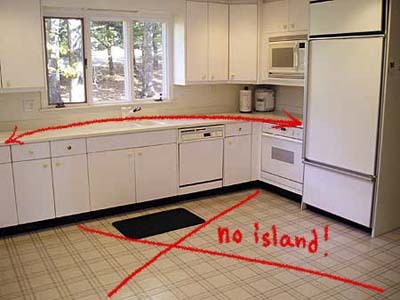 Kitchens should be properly sized based on the size of your home and your family. Kitchens sell homes - but maxing out the size of your kitchen at the expense of the rest of your house is defeating the purpose! This really goes for too much of any pattern - not just floral. Don't put the same pattern on your backsplash, tile countertop & walls. Don't make your walls so dizzying that you can't locate the peppermill because it's now camouflaged! Too much of any pattern in your kitchen can make you lose your appetite.